Dr. Mason recently became certified in Veterinary Medical Acupuncture. Attending more than 80 hours of lectures and practical demonstrations. We have begun apply this tool to help pets with chronic pain management and many other medical problems of pets in Kokomo, Indiana and surrounding areas. Acupuncture has been studied extensively for the past 40 years in veterinary medicine. Modern science can now explain based on neuromodulation how it works. More appropriately termed medical acupuncture, our understanding has evolved way past the traditional Chinese approach to a more scientific understanding of the practices effect on organ systems. Here we use it as an adjunct to a multi-faceted approach to pain management in pets. Traditional acupuncture is based on a belief system, and much folklore about yin and yang, and the manipulation of "energy" flows throughout the body. Now we know that there are known physical, chemical and neurologic effects of placing needles in certain areas of the body. Using modern scientific approaches such as function MRI (magnetic resonance imaging) and other methods we now know we can modulate, or alter the production of natural internal opioids (endorphins) and stimulate parts of the brain that interact with other parts of the body. Effective acupuncture points are generally found in areas where nerves are plentiful and also where nerves interact with blood vessels. The effects of acupuncture can be enhanced by the modern application of electrical stimulation across points. The most common application for this tool is for pain management, but it can be very beneficial for many other maladies such as gastrointestinal disorders, urinary problems and appetite stimulation. Combined with conventional pain medications, supplements, and even some massage, acupuncture can improve the quality of life for pets in many ways. We may be able to combine this with therapeutic laser treatments, massage and myofascial work to try to avoid surgery for conditions such as ruptured disks in the back, cruciate ligament injuries, and to decrease the amount and frequency of certain arthritis drugs. 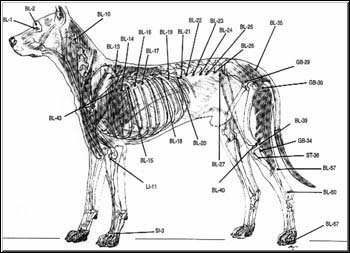 Initially the pet will need a thorough evaluation to identify the source of it's problems, which will include a complete history, physical palpation of muscles and joints and neurologic examination. Then a plan is developed where exactly to place the needles and whether or not electro-stimulation will be required.